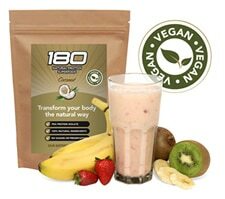 If you want a natural, delicious, nutritious vegan meal replacement without any questionable ingredients, 180 Nutrition has the answer. Our versatile, all-natural vegan protein formula contains everything you need to stay energized and satisfied throughout your jam-packed day. Whether you’re a bodybuilder, active professional or a busy homemaker, our supplement provides you with essential nutrients in a formula you can trust. How is 180 Natural Protein Superfood different? Unlike many meal replacements on the market, the 180 Natural Protein Supplement is just that — 100-percent natural. We don’t use any chemicals, artificial flavours or preservatives in the making of our supplement. You won’t find any oils, sugar, whey or corn syrup either. Instead, we rely on the wholesome goodness of nature’s superfoods to power our vegan meal replacement supplement. Our supplement provides the protein you need from pure ingredients to help you achieve optimal energy levels, healthy weight loss and maximum overall fitness. Since we don’t rely on sugar to give you energy, you won’t experience spikes and dips in your blood sugar and energy levels throughout the day. The 180 Natural Protein Supplement is designed to fit even the fastest-paced lifestyle. Its versatile formula is quick and easy to prepare using your preferred method. Add it to a smoothie with your favourite fruits and vegetables for an energising breakfast or snack. This is a convenient, delicious way to squeeze more greens and other produce into your diet. 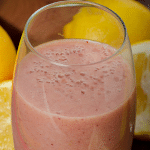 Smoothies offer the perfect way to get the pickiest eaters in your household to reach their minimum daily requirement of protein, fruits and veggies without even knowing it. Smoothies aren’t the only way to incorporate the 180 supplement into your diet. Use one of the many recipes on our site to cook fabulous, delicious, nutritious meals. Our recipes can accommodate a number of healthy eating plans, from the paleo diet to gluten-free options. Whatever your way of eating, you’re sure to find just the right delicious recipes for you and your family. Read our blog for recipes and other great information on achieving optimum health. Whether you’ve tried other protein supplements with poor results or want to try our delicious, healthful vegan formula for the first time, our money-back guarantee ensures your complete satisfaction with the 180 Natural Protein Supplement. Try a starter pack today – We know you’ll feel the difference!